Julia Osborne wrote a great review of Las Vegas Contemporary Dance Theater’s star-studded fifth anniversary concert at the Smith Center for the Performing Arts on May 29. The show included works by such choreographers as Ulysses Dove, Lorenzo Rennie Harris and LVCDT artistic director Bernard Gaddis, among others. The article has some nice interpretations of the choreography and Osborne gave the show a sparkling review, noting that the concert was excellent despite a few technical malfunctions. To read the full story, visit the Las Vegas Review-Journal website here. Las Vegas Contemporary Dance Theater opened its arms to the community for its fifth season and debuted new company members during two free concerts on Feb. 10 and 11. “An Evening of Dance” and “An Afternoon of Dance,” performed at the West Las Vegas Library Theatre on Lake Mead Boulevard, were also appropriately timed for African American History Month, a fitting gesture from the diverse company. The show itself encompassed a breadth of genres and ended on an audience favorite, a dynamic piece by artistic director Bernard Gaddis called “Ebony Suites.” Think of Twyla Tharp’s contemporary ballets, rife with strong characters and intertwining story lines — and fabulous dancing, of course. Christina Taylor, a new member of LVCDT, began the piece with a soulful and dignified solo to “Grandma’s Hands,” a rich and heartfelt track. Eddie Otero continued the tale with “Ain’t no Sunshine,” something of a signature piece for him, which was evident in the enthusiastic response from the audience. Marie-Joe Tabet and Christopher McKenzie, spicy and silky-smooth in equal measure, brought a lovely fire to the number. The two toyed with each other, sidling up and sauntering away in an elaborate and engaging emotional display. McKenzie, another new LVCDT dancer, performed Gaddis’ former role well, capitalizing on the Ailey-esque choreography with his viscous smoothness. “Dreamtime,” a cerebral piece by Elisa Monte, explored the aboriginal Australian idea that spirits vacate people’s bodies at night. The number used mirroring and counterpoint judiciously to create a nice sense of duality, and the fluid staging suited the dynamic movement. Tabet, emanating an air of regality, stood out as alacritous and commanding. Intriguingly lit from the side, “Dreamtime” was a contemporary step right up LVCDT’s alley. “Bata” began the show with percussive style and a red-lit stage. West African undulations twined around Horton lines, underscoring the strong energy and swaying hips of the company. Some of the unison choreography was a little questionable, but the audience members made it clear that this didn’t bother them a whit. Overall, the pacing of the show was decent, although two intermissions made the program a bit lengthy. Taylor, McKenzie and Caine Keenan, newcomers to the company, fit in well with the other dancers and brought unique artistic vibes of their own. Gaddis made an appearance in a button-down and slacks for this show and explained that he’ll be dancing less with the company, although his high-spirited introduction of his dancers made it clear that his commitment level to the company hasn’t shifted much. LVCDT will be setting foot (or feet, as it were) onstage at the Smith Center in May. “An Evening of Dance” begins at 7 p.m. on Feb. 10 and “An Afternoon of Dance” is at 1 p.m. on Feb. 11. Both shows are at the West Las Vegas Library Theatre at 951 W. Lake Mead Blvd. Come early, because general admission means that good seats fill fast. For a review of last year’s show, follow the link here. Guest choreographers Miguel Perez and Zane Booker joined forces with LVCDT’s Bernard Gaddis for the company’s spring concert on May 6-8 at the West Las Vegas Library Theatre. The program featured four pieces, one from each of the guest artists and two, including the anticipated frog-work “Phib,” from Gaddis. Perez’s “Emergence” was a twining, full-bodied and expressive piece that seemed to sponge up emotion and release it when called upon. Lovely adage work from the girls and a playful duet lightened the somewhat staid tone and contemporary choreography spiked with classical lines furthered this dichotomy. The glimmer of individuals throughout the piece made the movement simultaneously surreal and relatable. Effective use of music and light lent a feeling of time passing and the result was a sobering but optimistic experience for the audience. Gaddis’ “Sacrifus,” a study in choice and consequence, began the second act with a compelling male duet and a kind of visual percussion that the company does well. Many of the interactions between the dancers built to the charged third movement of the piece, which culminated in a galvanic stand-off between the men and women. Throughout the number ran an undercurrent of complex relationships, all blanketed by a burning energy and ferocious partnering. Looking for the human moments in the piece was one of the pleasures. The choreography itself was busy and detailed, a fact the dancers took mostly in stride. This kind of number meshes well with the artistic strength of the dancers and the confidence that emanated from each was gratifying to see. “Phib” hopped into the final slot of the show as a fantastic summation and a number that holds great promise for outreach programs. Giggles from the audience began right away, but it was clear that the dancers took this frog business very seriously. A watery, reedy feel set the stage for splayed-legged rolls and ballet-mistress-approved grand plies. The choreography itself was interesting in that the character movement rang distantly of funk in the precisely timed isolations and a sweet duet midway through the piece lent some emotional depth. Kudos also go to Gaddis for resisting the temptation of too much silliness, because the piece certainly benefited from it. LVCDT has a distinct genre that they dance well and this concert showcased this effectively. There is also something about seeing a posse of frogs applauding their artistic director that is not to be missed. Neither is the fall concert series. LVCDT will be performing “Vespers” by choreography icon Ulysses Dove on November 4-6. Keep an eye on their website here for more information. Las Vegas Contemporary Dance Theater puckered up just in time for Valentine’s Day and sold out the West Las Vegas Library Theatre on Feb. 11. “Love with LVCDT” featured 22 works performed by the company and guest artists and was an ideal show for the heart-centric holiday. A program with a running time of more than two hours might seem daunting, but the energy of the performers and the variety of the choreography ensured that the time went quickly. “Mood Indigo,” a softly shifting contemporary ballet, introduced the show splendidly and two pieces from “Opulence” concluded the second act. Both were expressive and dynamic numbers but for entirely separate reasons, effectively demonstrating the depth and breadth of the contemporary ballet genre. From there, the program touched on Chicago-style jazz, country-themed character pieces and Ailey-esque duets. For audience accessibility, the cowboy-style “Give One Reason” and “Why Haven’t I Heard from You,” were as good as it gets. “Ain’t No Sunshine,” a solo featuring Eddie Otero, and “L.O.V.E.,” with Otero, Roman Pantoja, Antoine Banks-Sullivan and Emanuelle Mirbal-Torres, were both comfortably masculine. “Bang Bang,” with Marie-Joe Tabet, was angst-filled and lovely. The partnering in the show was excellent. None of the numbers were overly long and the pacing of the concert was well-balanced, with a mix of easy crowd-pleasers and more abstract pieces. An interesting detail in the concert was that every piece was choreographed by Bernard Gaddis, the founding artistic director of LVCDT. Gaddis gracefully acknowledged this with chagrin and a laugh. The sheer volume of work makes this feat impressive and, while the flavors were distinctly modern, jazz and contemporary ballet, the variety wasn’t lacking. LVCDT classics hit the stage backed by evidence of considerable rehearsals. In addition to “Opulence,” repertory pieces like “Bata” and “Rhythm 101” were hard-hitting numbers that contributed to the dynamism of the concert. “Papa’s Got a Brand New Bag” was lively and swinging and brought a New Orleans flourish that was a delight to watch. “Sacrifus,” with music by Kevin Keller, transcended cute character roles and commanded attention from the beginning. Trembling strings, coupled with dramatic lighting changes, seemed to dictate the movement of the three dancers and the effect was at once stark and emotionally affecting. This could be a signature piece in the making, and rightfully so. Agnes Roux, a founding member of the company that now dances with Cirque du Soleil’s “Zumanity,” was a guest artist in the show and her vibrant personality was impossible to overlook. “Don’t Explain” and “Come On Strong” suited the leggy dancer well, each with flying attitudes and nuanced transitions that made good use of the space. Numbers like “Baby You Got What it Takes,” with Gaddis and Heather Farrell and “All of You,” performed by Ian Dodge and Lacy Simpson, were heart-warming and easy on the eyes. “Love in Stillness,” with Erin Christiansen and Mirbal-Torres, and Tabet in “Ms. Marie-Joe’s Blues” kept drama in good supply. “What a Little Moonlight Can Do,” featuring Danielle Howard, was a straightforward and jubilant piece with sweeping lines and plucky port de bras. Ultimately, the annual concert again established itself as a warm-fuzzy staple in the city’s spring lineup. Gaddis has found a good niche for his company and, with performances like this, exploits this effectively. The result is intriguing and very enjoyable. Advice for the next year’s show: come early. Seats fill fast. A nearly four-year-old Vegas-based company underscored an unwritten rule in the dance world in Vegas: This is not a “company” kind of city. Roman Pantoja and other LVCDT members perform"Ebony Concerto"
The Las Vegas Contemporary Dance Theater performed their annual fall concert series Nov. 5 – 7 in the West Las Vegas Library Theater on West Lake Mead Boulevard. In a city dominated by iconically elaborate productions, dance companies like LVCDT are an anomaly and, potentially, a breath of fresh air.The small theater drew a modest (but very supportive) crowd and the show was a solid run at strong concert dance, which is something generally missing in Vegas. Bernard Gaddis is the founding artistic director of LVCDT and boasts a resume with credits from the Alvin Ailey American Dance Theater, the Philadelphia Ballet Company and Cirque’s “Zumanity” and is currently performing with “Mystere.” He is oft-quoted about the aspirations he has for the company, saying he wants it to become a strong Vegas voice in the dance world — a noble goal. And by most accounts, he has the experience and the vision to back this up. However, the continual justification of the company’s success doesn’t necessarily come across positively. You sold out a couple thousand-seat theater in Mexico —okay, awesome. Where’s that audience now? Granted, LVCDT has several things, and people, working for it. Gaddis’ experience could be an obvious asset, although the accompanying diva mentality tends to be alienating. For the fall 2010 concert, accomplished guest choreographers Milton Myers and Greg Sample each set pieces on the company. Most of the dancers themselves are polished and the partnering in particular was excellent. Because of the ground-breaking nature of the company, though, balancing the deliberately different with the audience-accessible can be a challenge. A performer’s connection with the observers and fellow dancers alike is tantamount to this accessibility and this was somewhat lacking in the fall concert. The show featured five pieces, one each choreographed by Milton Myers, Marie-Joe Tabet, Greg Sample, Debra Lacey and Gaddis himself. “Ebony Concerto,” choreographed by Myers to a Stravinsky jazz score, was an exuberant contemporary ballet that opened the show. The highly interactive piece bounded forth in the same vein as Jerome Robbins’ ballet “Interplay,” eliciting laughs from the audience and starting the show on a playful note. Strong production elements were evident in the use of lighting, producing classy silhouettes and emphasizing the back-and-forth nature of the piece. Tabet’s solo, choreographed by Gaddis, was appropriately titled “Ms. Marie-Joe’s Blues.” The number echoed the jazzy vibe of the first piece and threw in a dash of blues for good measure. Tabet’s piece was to a track by Melody Gardot and mirrored the artist’s low and beseeching voice with flexed-hands choreography and a pleading feel. The number outlasted its welcome slightly as the pedestrian choreography became predictable, but it was well-performed and pleasantly intimate. 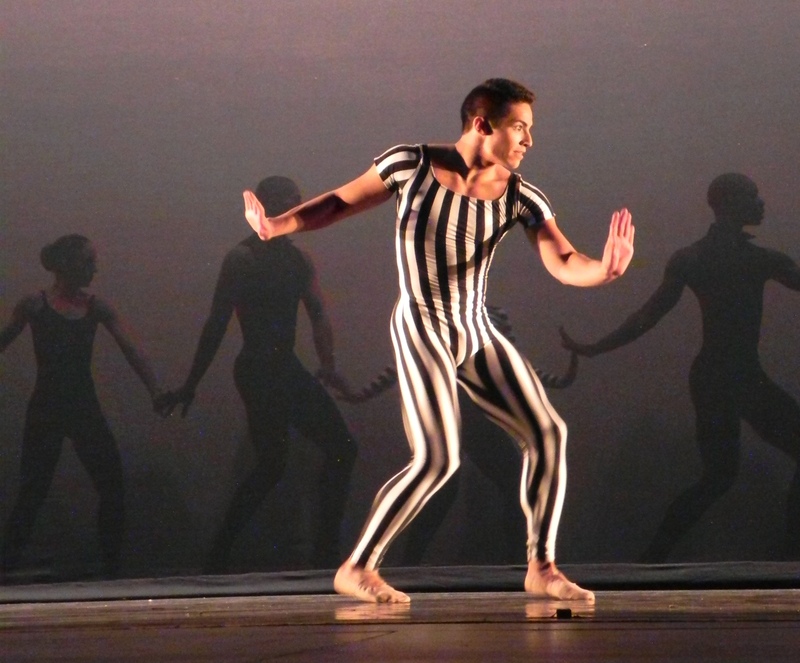 Sample’s piece “Eliade” defied the “contemporary” in “contemporary ballet” and opted for “modern ballet” instead. The effect suited the company and the theatrical nature was engaging. Synchronized choreography and simultaneous duets illustrated the cohesion of the corps and LVCDT’s strength in numbers. However, a strange dissonance was found in the stage presence (or lack thereof) of the dancers singled out as soloists. Despite the dynamic choreography, individual performers appeared to have a hard time establishing themselves as principals. “Whelm,” choreographed by LVCDT’s senior associate director Debra Lacey, stood out through its African modern, Horton and Graham aesthetics and audible breath. Teasing glimpses of audience-friendly battements and impressive turns were few in choreography redolent with Graham hands and long lines, but inventive partnering and a more evident storyline was mitigating. Gaddis’ somber “Opulence” was perhaps the most emotionally expanded in the show and the dancers were much more engaging as a corps than individually. The choreographer’s affinity for pas de deux was evident and several such vignettes would have done well at the top of the performance. The choreography could have been more synchronized, but the contemporary ballet label fit perfectly: it was sassy and self-possessed, if a little muddy at times. As a whole, the show highlighted the paradox of the young company talking a big game. Having the self-confidence to run with the big dogs is one thing, but perspective is entirely another, and, perhaps unlike LVCDT, perspective might be a bit underrated.